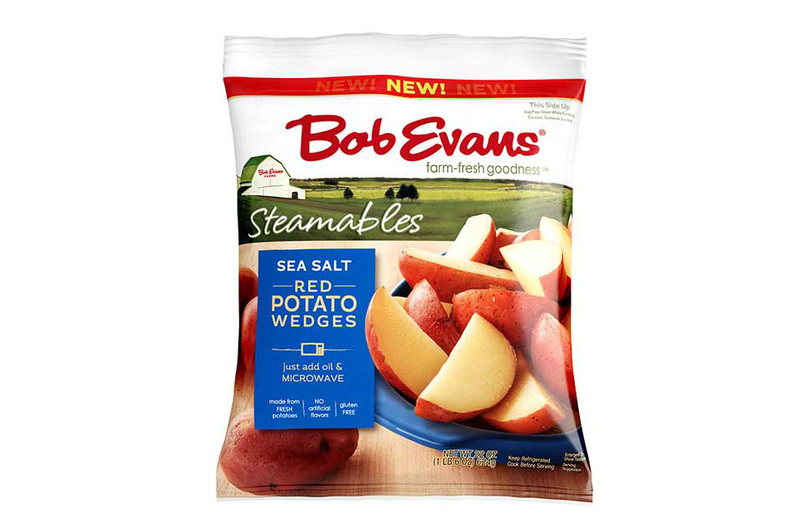 Columbus, Ohio-based Bob Evans Farms is adding an entirely new side dish product line, Steamables, and two more meal solution products to its Family Classics product line. The new Steamables product line launched with three varieties of potato wedges, including Sea Salt Red Potato Wedges, Steak House Red Potato Wedges and Garlic Red Potato Wedges. Additionally, the Family Classics product line has gained two new protein-rich pasta meals: Italian Sausage Marinara Pasta and Beef Stroganoff Pasta. These products are available at select retailers nationwide where Bob Evans Farms foods are sold, starting Feb. 1. Bob Evans Farms Steamables are available in a 22-oz. bag and contain 100 calories or less per serving. Steamables are ready after five minutes in the microwave and come in a bag with a resealable zipper so consumers can add their choice of cooking oil prior to cooking. The Family Classics product line was introduced in 2018 as a complete meal solution. It launched with two chicken pasta meals: Roasted Chicken Alfredo Pasta, and Creamy Chicken & Noodles. Bob Evans is expanding the line to include two new kinds of pasta with protein. 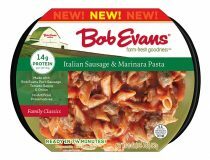 Italian Sausage Marinara Pasta has 11 grams of protein per serving and features Bob Evans Italian Sausage, tomato sauce and onion. Beef Stroganoff Pasta features prime rib beef, mushroom and onion and contains 14 grams of protein per serving. Both varieties contain no artificial flavors, have two servings per container and are under 300 calories per serving. Owned by Post Holdings Inc., a consumer-packaged goods holding company, Bob Evans Farms is also a leading producer and distributor of refrigerated potato, pasta and vegetable-based side dishes, pork sausage and a variety of refrigerated and frozen convenience food items under the Bob Evans, Owens and Pineland Farms brand names.